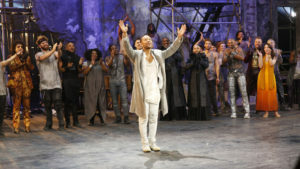 “Jesus Christ Superstar Live” carried NBC to a win in the Nielsen overnight ratings on Easter Sunday. Airing from 8-10:23 p.m., “Jesus Christ Superstar Live” drew a 1.7 rating in adults 18-49 and 9.4 million viewers. NBC’s last live musical, “Hairspray Live,” drew a 2.3 rating in adults 18-49 and 9 million viewers back in December 2016. It is also up slightly over Fox’s live version of the religious-themed “The Passion” musical from March 2016, which drew a 1.6 and 6.6 million viewers. However, as “Jesus Christ Superstar” ended at 10:23 p.m., its initial numbers will be subject to adjustment later today. Elsewhere on broadcast, a new episode of “American Idol” (1.6, 7.4 million) held steady with last week’s Sunday episode. “Deception” (0.8, 4.2 million) ticked up slightly in the demo. For CBS, “60 Minutes” (0.7, 8.1 million) unsurprisingly fell from the massive ratings drawn by the Stormy Daniels interview the show aired last week. Freshman drama “Instinct” (0.6, 6.7 million) slipped over 50% in the demo in its third week. “NCIS: New Orleans” (0.8, 7.1 million) and “Madam Secretary” (0.5, 5.7 million) were also down versus last week. On Fox, “Bob’s Burgers” (0.6, 1.5 million) took a hit, while “The Simpsons” (0.9, 2 million) was even. “Brooklyn Nine-Nine” (0.8, 1.8 million) was down slightly, while “Family Guy” (0.9, 2.1 million) was even. “Last Man on Earth” (0.6, 1.4 million) was down. NBC topped the night with a 1.3 rating and 7.4 million viewers. ABC was second in the demo with a 1.2 and third in total viewers with 5.8 million. CBS and Fox tied for third in the demo with a 0.7. CBS was second in viewers with 6.9 million. Fox was fourth in viewers with 1.7 million. PREVIOUSLY: NBC’s live staging of “Jesus Christ Superstar” is among the top shows of Sunday night in the early Nielsen numbers. The live musical, which starred John Legend in the title role, averaged a 6.0 rating in Nielsen’s metered market households. That is good enough to tie with “60 Minutes” on CBS in households as well as top ABC’s “American Idol,” which drew a 4.5.